Another day, another Oriental-themed slot. 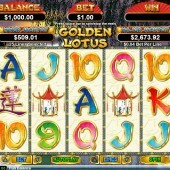 And while well-regarded slot developer RTG’s Golden Lotus may not quite touch the heights of their other Japanese-themed slot, Ronin, or the lush Asian themes of Next Gen Gaming’s Cherry Blossoms, it certainly delivers on other levels. A 5 reel, 25 pay-line slot, the game will be recognizable to anyone who’s familiar to fans of RTG slots: betting starts at just $0.01, there are some pretty – if unspectacular – graphics on the reels, and there’s a randomly-awarded progressive jackpot to be won. As for those reels, they’re packed with relevant symbols like Geishas, ornamental lions, a priceless vase, lantern, Lotuses, plus regular 9-through-Ace card symbols, here presented in an Asian stylee. The Golden Lotus symbol is the Wild symbol on Golden Lotus and will substitute for all symbols except for the White Lotus scatter symbol. However, the Wild also Scatters and when three Golden Lotus symbols are hit anywhere, you’ll trigger the Golden Lotus bonus game. Firstly, you will have four picks from the eight golden lotuses shown on-screen. Up for grabs is a prize haul of 100x your total bet or up to 20 spins. During the free spins all White Lotus scatters will change to Wilds or game logos, and prizes are tripled. Sounds good, right? Well, the bonus spins can be re-triggered too. 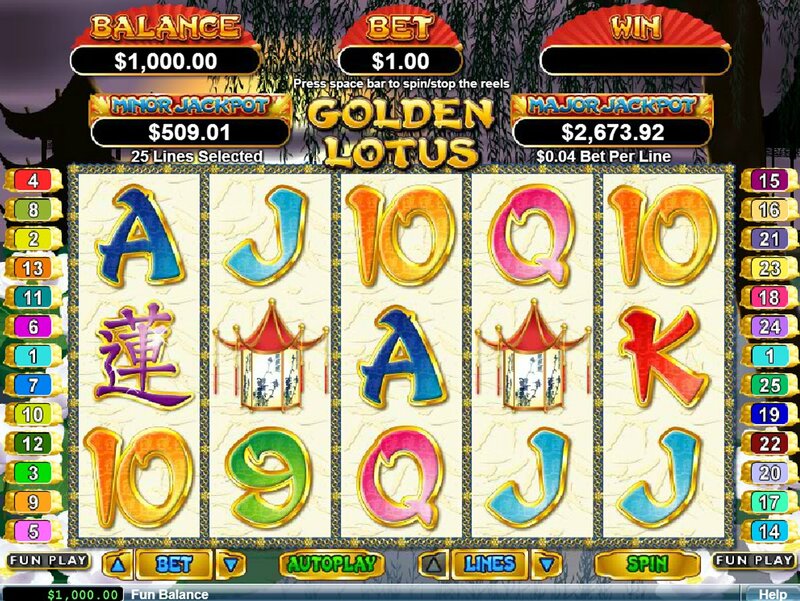 There’s more free spins goodness to be had if you hit three or more White Lotus symbols on the reels during the base game. You’ll win 8 free spins for triggering the round, with the White Lotus again turning to Golden Lotus Wilds or logos. Also, there is a multiplier of 3x, 4x or 5x applied to each win (check the award at the top of the game screen). Three or more Golden Lotus symbols on-screen during the bonus round will re-trigger the spins. If two free spins rounds sounds good, there’s more to be had, with RTG’s progressive jackpots – two of them – awarded at random. That is always good to see in an RTG slot game. I’m a stickler for good free spins rounds, and this game certainly delivers on that front. With the added bonus of some progressive jackpot fun, there’s no reason why Golden Lotus shouldn’t be at the top of your must-play slots list.